The Rheem Prestige Series™ High Efficiency Two-Stage RPRL-JEC Heat Pump can provide year-round heating and cooling comfort. 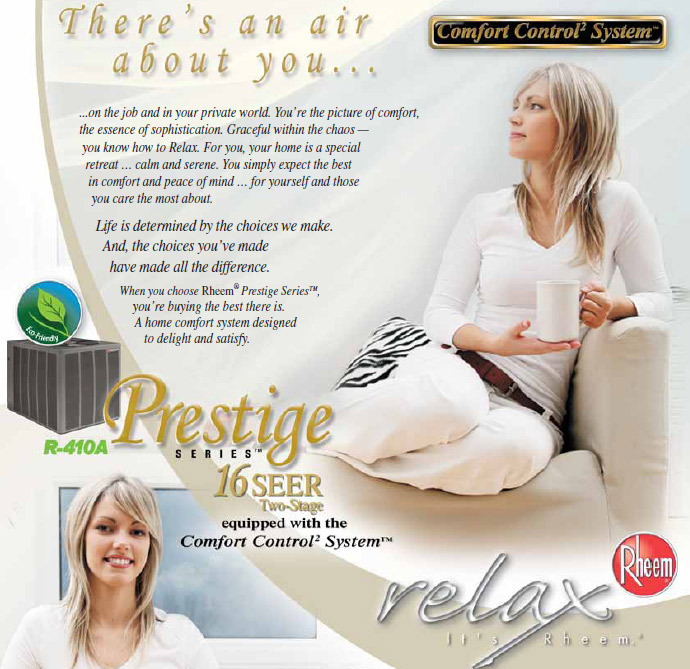 The Rheem RHPL air-handler, equipped with auxiliary heating elements for supplementary heat was designed especially for use with the Prestige Series™ heat pump. Together they deliver 3 stages of heat and 2 stages of cooling for precise temperature control and optimal energy efficiency. These units offer comfort, energy conservation and dependability for single, multi-family and light commercial applications. 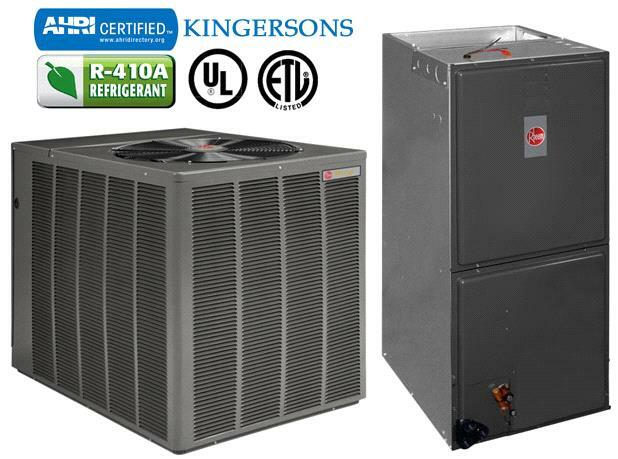 The Rheem Prestige Series™ Two-Stage RPRL- JEC heat pumps are the result of an ongoing development program for improved efficiencies and a continued tradition of delivering the highest quality and efficiency. These units also contain the most advanced alternate refrigerant which contains no chlorofluorocarbons (CFCs), or hydro-chlorofluorocarbons (HCFCs), or other compounds that may leak from air conditioning systems and potentially harm the protective ozone layer of the Earth’s atmosphere. The Comfort Control2 System™ provides over 37 on-board diagnostics and fault history codes for condensing units by detecting system and electrical problems. The integrated diagnostics with Active Protection™ prevents compressor operation when potentially harmful conditions are detected. It sends “Call for Service” alert notification to the thermostat to alert you of required service. When installed with a Serial Communicating Air Handler and user interface control Series 500 thermostat this unit offers auto-configuration, diagnostic messaging and full communicating capability, to increase your home comfort even further. Unit can be conventionally wired using 24VAC with non-communicating Rheem Prestige air-handlers or furnaces with non-communicating thermostat. If you prefer to keep your old thermostat, in most cases, this heat pump will allow you to do so. A compressor sound blanket is standard to provide your unit with quieter unit operation. Units are equipped with a reliable Two-Stage compressor for precise temperature control with an On-Demand dehumidification feature. When matched with variable speed gas furnace or air-handler, the system adjusts airflow to help control humidity for unsurpassed comfort in the cooling mode. Attractive, louvered wrap-around jacket protects the coil from yard hazards and weather extremes. Top grille is steel reinforced for extra strength. Cabinet is powder painted for all weather protection. The units are constructed with painted galvanized steel cabinets for added reliability and durability. All controls are accessible by removing one service panel. Removable top grille provides access to the condenser fan motor and condenser coil, for an easier time with serviceability. Includes an energy efficient GE® ECM® Motor, which in most applications, enhances the SEER rating of the outdoor unit. It also slowly ramps its speed up for quiet operation and enhanced customer satisfaction.